Why do couples choose you to be their Wedding DJ? What makes you different? Mostly, it’s the results. Couples tell me that they loved being able to relax at their own wedding, knowing their day was exactly what they they wanted. And that they enjoyed having me as a partner throughout the whole process in creating a detailed plan and making it happen for them. What's your advice for someone who wants to hire a Seattle Wedding DJ? For engaged couples, the best advice I can give you is to try to make the planning process fun. Use it as a way to learn to more about yourselves as a couple and the ways you make decisions together. Make an evening of it interviewing a DJ (or any vendor) and then go out to dinner and talk about what you liked or didn’t like about them. 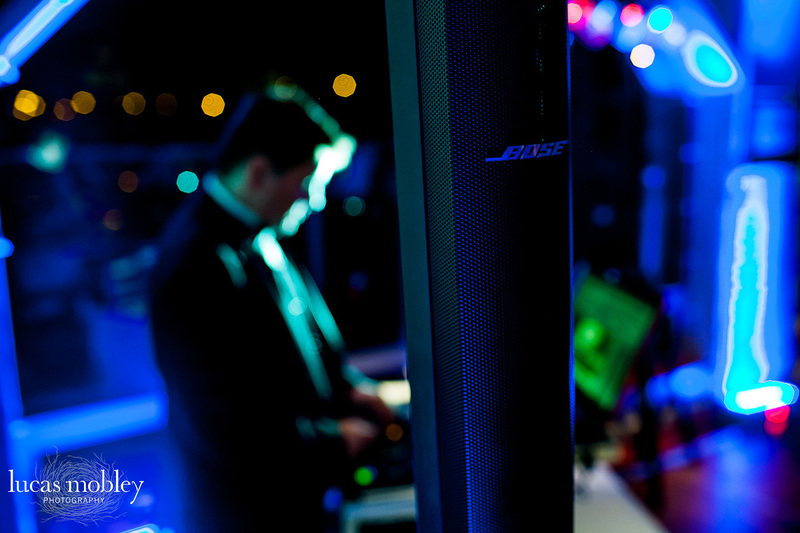 Sure, it can be hard to find the best Seattle Wedding DJ for YOU. But it’s worth it. Interview as many DJs as it takes to find one who you’re really excited about. For as long as I can remember, I was always that Music Guy, collecting music, hanging out at record stores, going to concerts (350+). So when my friend Annie’s wedding DJ bailed on her four days before her wedding, she asked me to step in. I did and it was really satisfying. Will you personally be the DJ on our day? Yes indeed. You will be working with me the entire time. You won’t be “assigned” some cookie-cutter DJ by a DJ company that doesn’t care about you. I’ll be your partner every step, from the very start to the end. I’ll get to know you and ask a lot of questions about what you want from your day. We’ll use that information develop a detailed plan that fits your personality. And then it will be me all tuxed up and making things run smoothly on your night. Can you provide music for our ceremony? Will the guests be able to hear our vows? For your wedding ceremony, I’ll mic both the officiant and groom with small wireless lapel mics so that your guests will be able to hear everything nicely. If you have live musicians, I’ll coordinate to run their sound through my system. If you have readers, I’ll make sure they have wireless handheld mics. Do you act as the “MC” and guide the event’s flow throughout the evening? Absolutely. Behind the scenes, I’m working in closely with the caterer, photographer and other vendors, to ensure that the itinerary stays on track and that we all work together to keep the evening flowing smoothly. As the MC, I’m giving the guests all the information they need about what’s going on and what’s coming up. How would you define your style as an MC? My philosophy is to serve as a host, make sure that your guests feel welcomed and involved. I am a skilled and confident MC. People say that my friendly and outgoing personality comes through. But the night is not about me and I don’t feel a need to be the center of attention. You’ll never hear me talking just because I really like my own voice. This is YOUR special day, not mine. So mostly, I want to give your guests all the information and guidance they need. And hopefully a few laughs along the way. What kind of couples are good fits for you? Couples who believe it’s a significant decision find the best wedding DJ for them — that their DJ will play a major role in the success of their reception. Couples who want to make sure their guests have fun. Offbeat couples who want a partner who embraces their ideas. Couples who have cultural traditions they want to incorporate in their their day. Couples who are open minded about advice and suggestions on what may or may not work. Personality-wise, couples whose friends describe them as down-to-earth. OK, so then who are not such good fits for you? Couples who think all DJs are the same and just want someone to hit “play” on some music. Couples looking for a “club” atmosphere. Couples who want their DJ to play Y.M.C.A. and dress all the groomsmen in outfits, to play an inflatable guitar and to nag their guests to get out on the dancefloor. Couples who are mostly looking for the cheapest price. Couples who don’t want suggestions or advice. Why do you do weddings? The Bose speakers look great at a wedding. I REALLY want your guests to hear the emotions in your vows, hear the inflections of those giving toasts and (selfishly) hear announcements that I make. So I use high-end audio professional equipment. The sound quality is outstanding. I use the best Bose L1 Tower speakers, which sound great (and look quite nice.) My mixer is the Denon DN-MC600 and I keep looking neat in a case by Odyssey. For ceremonies (or when I’m integrating live instruments into my system), I use a Mackie 1202-VLZ4 mixer. As for mics, I use have a Sennheiser lapel mics that I typically put on the officiant and groom for the ceremony and Sennheiser hand held mics for readings, announcements and toasts. I ALWAYS have backup equipment with me, so I’m prepared. What is it like for us to plan with you? What’s that process like? We have as many planning meetings as we need to cover EVERYTHING. From Grandma Shirley’s walk down the aisle to the details of your final send off, I’ll throw out ideas for activities that feel like a good fit for your personalities. Some you’ll like. And some you won’t. That’s OK. Many couples tell me our wedding planning meetings were some of the most fun times they had in the whole process. Can we pick the music or is that up to you? Of course, you can. The night should reflect your personalities and a lot of that can be reflected by the music that is meaningful to you. However, if you just want to give me general guidance like a few songs, artists or genres that you like, I’m happy to fill in as much as you like. I am a DJ after all! I have detailed wedding music song lists that I’ll share with you. What are the best ways to note our musical preferences? You can designate songs as “must play,” “if possible,” or “do not play.” But if you have your own wedding music ideas, I’m happen to take them in whatever form is convenient for you: on your phone, in a spreadsheet or wherever. We can even create shared playlists on Spotify. What if you don’t have a song that I want to hear? Definitely. Requests are such a fun way to involve guests in the dancing part of the night. What if I want you to play a song or do something that you don’t think will work very well? I’ll say it quite diplomatically (you are the customer after all), but I’ll definitely give you candid advice based on my experience. I think it would be DJ malfeasance if just I didn’t give the benefit of my experience. And if I still want to play that song or do that other thing? I’ll play it or do. No question. It is your wedding and I am there to support you. What do you think about the Chicken Dance, Macarena, Y.M.C.A. and songs like that? Other couples consider some of them to be some of the most fun wedding songs and love the idea of dancing to them at their wedding. Some families RUN to the dance floor to share in them. The only thing that matters, though, is what YOU think. On your planning form, I’ll ask you for your comments on each of them and then respect your wishes. It’s your wedding. I even have a list of the most common cited “do not play” songs for weddings. How do you approach working with other vendors? Your officiant will sound clear. Your caterer’s food will be served hot, because the Grand Entrance was performed on time. Your photographer will get the best shots of your toasts, because they’ll happen where the light and background are the best and I’ll coach the people giving toasts on where to stand. Your videographer will get a clean recording of everything from the soundboard. I don’t judge myself on whether the music was great. I judge myself on whether your whole wedding day was great. And a large part of that is helping to make sure that you got the best from everybody on your team. Wow, that sounds like more than just a DJ? Well, yes, I can’t deny that. Thank you for noticing. Do you visit the venue in advance? I’ve been a Seattle Wedding DJ for many years, so I know most of the Seattle wedding venues quite well. But if you’re getting married somewhere new to me, I would definitely do a “site visit” so that I can make informed recommendations about how everything should flow. In fact, it can be a convenient place for our wedding planning meetings. How early will you be at the site to set up? I arrive around 2-3 hours prior to the event to set up and make adjustments for optimal sound performance before any guests arrive. There are occasions where the venue has a shorter setup time and I can work within whatever timing the venue offers. Yes. This is my profession and I treat it as such. Do you perform more than one wedding a day? No. On your wedding day, I am totally devoted to you and your event. And that’s all I do. Why don’t you have a Photo Booth? I want to focus on being the best DJ that I can for you on your day. In and of itself, that takes a lot of commitment. I don’t want to be distracted worrying about how some logo is stuck on the screen from a previous event or how some printer isn’t working. It’s your wedding. All I want to do is rock it for you. Do you have any special niches? 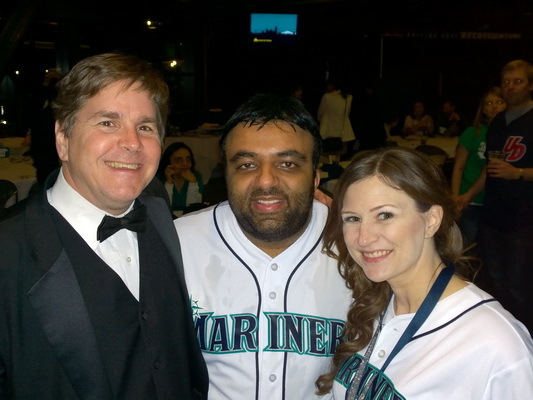 It was a blast to be the DJ for Patti and Manish’s Safeco Field Wedding. I have been a Seahawks season-ticket holder since 2002, so I’m happy to brainstorm ways to bring the feeling of CenturyLink Field to your event. Also, if you are a Bruce Springsteen fan, we will have a strong bond. I assume you charge extra to help with our ceremony? For overtime? Travel? Setup time? Editing our songs? Bringing a projector and screen? Let’s see how many ways can I say it: No, nada, uh uh, fuggedaboudit, not going to happen. 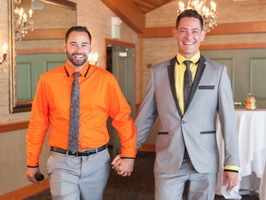 For more on my wedding DJ pricing in Seattle , check out my page: Wedding DJ Prices Seattle. When you tell me that you’d like me to be your wedding DJ, I’ll set up a website for you with planning forms, wedding music ideas, a contract that we sign electronically and a payment gateway. A $500 deposit secures your date and the remainder is due on or before the day of the event. Can we view a copy of your contract? Absolutely. I think it’s a great idea to understand our mutual expectations. 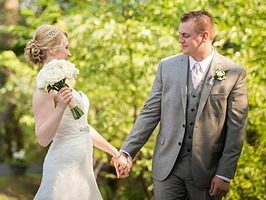 You can view a sample here: Seattle Wedding DJ Contract. Cash, checks, Paypal, Visa, Mastercard and American Express. You can make on-line payments through your custom website. I know it sounds flippant, but as soon as you know. Some popular dates – such as Saturdays from May to October – are committed more than a year in advance. Yes. In addition to weddings throughout Washington, I have done weddings in Oregon, Idaho, Montana, Colorado and Kentucky. Sure, I would be happy to provide you with references (and hope that after your event you’ll agree to be a reference for me). 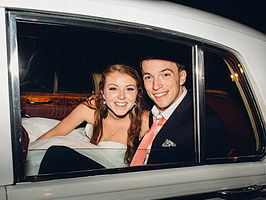 In the meantime, I encourage you to read more on my reviews for Seattle wedding DJ page. Yes, I am more than happy to meet with you to get to know you and share some of my ideas with you about your event. It’s not a sales pitch. I enjoy meeting new people and realize the wedding planning process can be intimidating, so it’s fun to help. That all sounds great. How can I get started? I would love to hear from you and chat about your goals. The best option is to fill out a short form on my Contact Alan page. Of course, you can email me at: alan@PugetSoundDJ.com, or call or text me at (206) 890-2930.